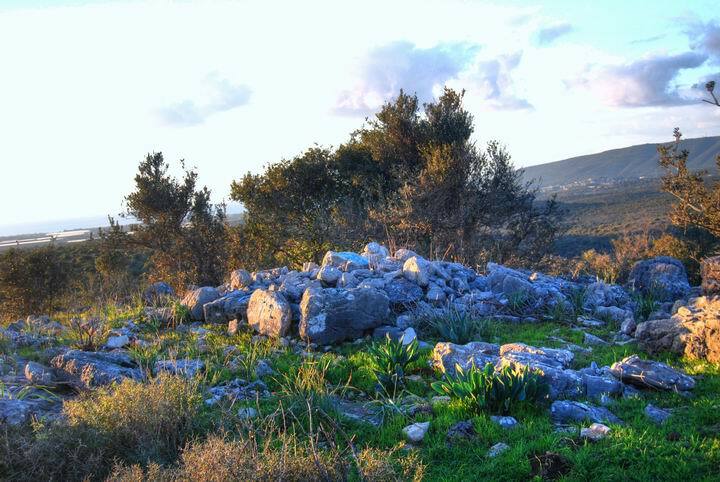 Ruins of a Roman/Byzantine village on the western edge of Kziv stream. In the site are traces of buildings, sheepfold, installations, and traces of a church. On the hillside are stone quarries and rock-hewn tombs. 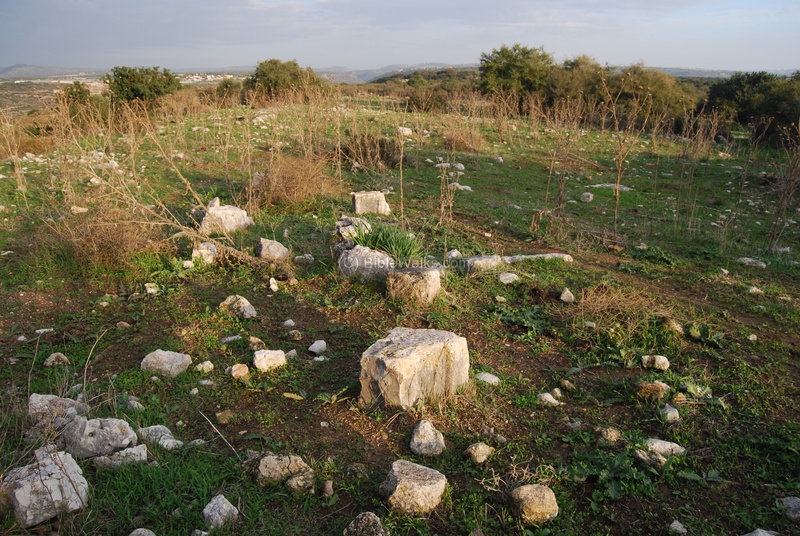 Khirbet Suggar (pronounced Soo-Gar) are the remains of a Roman/Byzantine village located on the west end of the Kziv stream in the upper Galilee. In the site are traces of buildings, a sheepfold (from a later period), agriculture installations (winepress), and traces of a church. On the steep hillside above the stream are stone quarries and rock-hewn tombs. 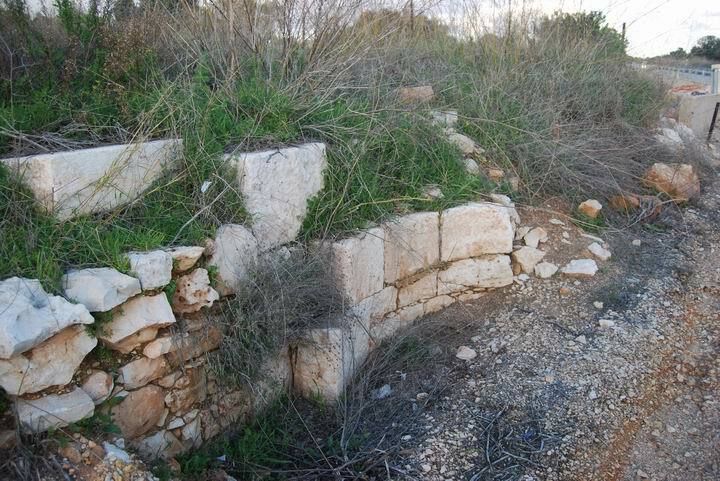 The site is located near the Cabri-Shlomi road (highway #70). The road to New Manot crosses the site on its south side, about 1.2KM from the highway, and so it is very easy to access the site. The size of the site is 200 x 250M. 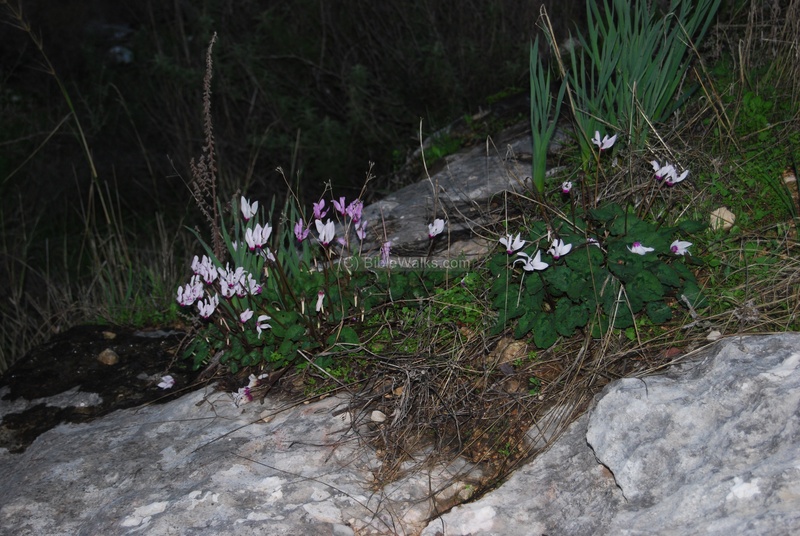 It is located on a ridge overlooking the Kziv stream at a height of 126M. It is 60M above and south to the valley. An ancient stone quarry is located on the north side of the site, overlooking the stream. 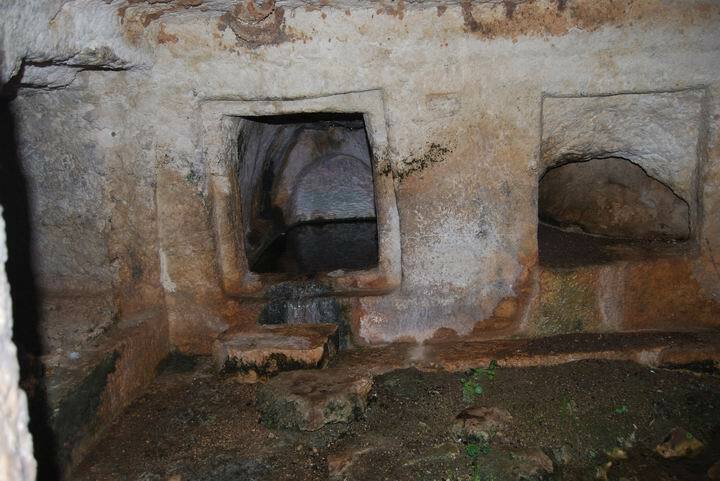 Among its walls are Roman/Byzantine rock-cut tombs. 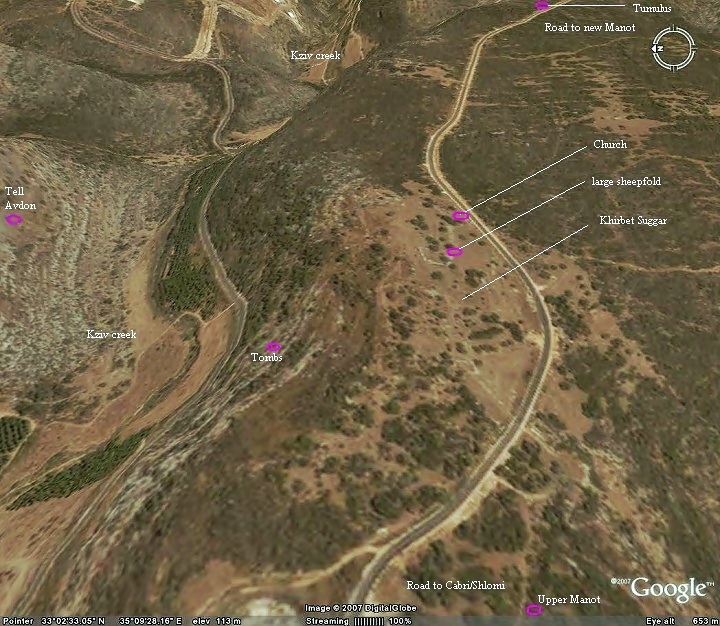 An aerial photo of Khirbet Suggar and the area around it is shown below, indicating the major points of interest. 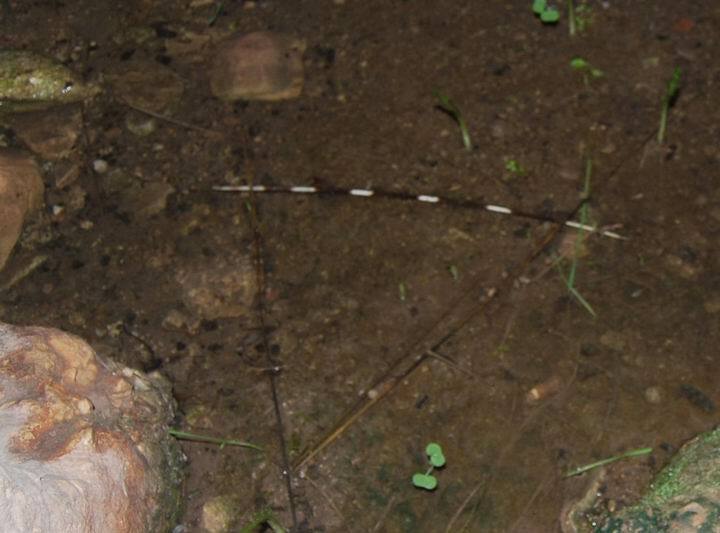 The site is located on a ridge, with Kziv stream on the north side. You can point & click on the purple points to navigate to the selected point. 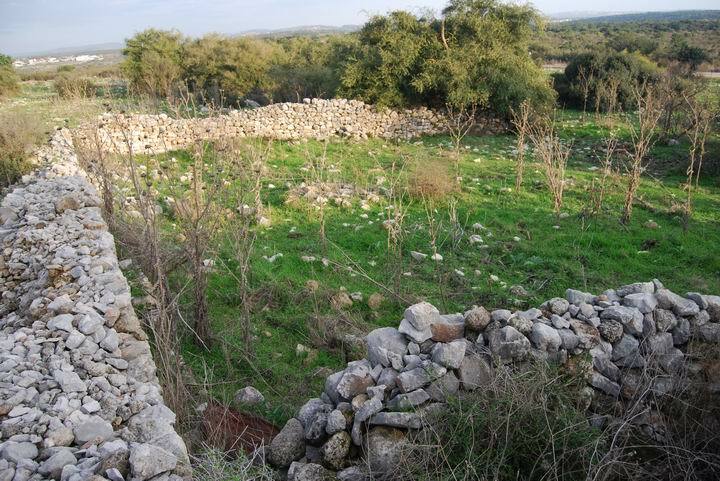 Along the Kziv stream, about 1KM east, are many findings starting from from the Neolithic period (83C BC- 45C BC). On the hill across the stream is Tell Avdon, a major Biblical site. In a nearby hill, overlooking the stream, there is a tumulus that may have been a prehistoric monument or tomb. The village was established at the Roman period. 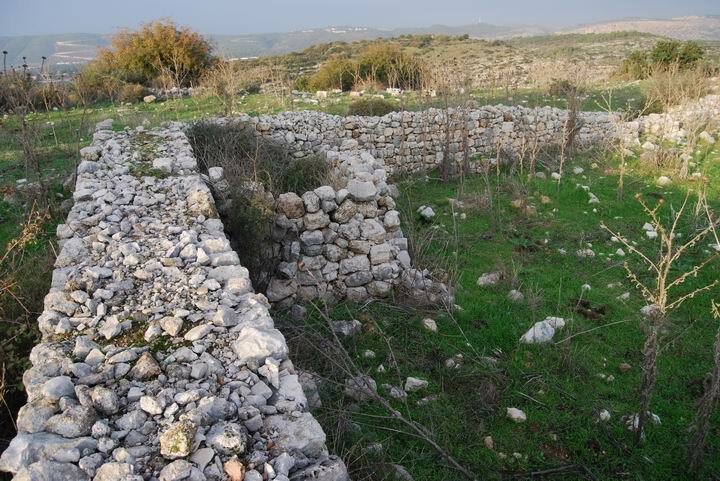 Another smaller Roman/Byzantine village is located nearby (800M west), called Khirbet Manot. A Byzantine church is located on the south-east side of the site, but the modern road crosses it. The site is in ruins today. A new settlement, Moshav Manot, was established in 1980 and named after Khirbet Manot. An aerial view, taken from a quadcopter above the road on the south side, shows the central section of the site. Traces of the ruins cover the hill. A rectangular walled area, which was an ancient sheepfold, is seen in the center. The Kziv stream flows just after the hill. Across the stream, on top of a steep hill, are the ruins of the Biblical city Avdon. In the far left background is the Mediterranean Sea, and the mountain of the "ladder of Tyre" (Sulam-Tzor) is seen in the far left background. 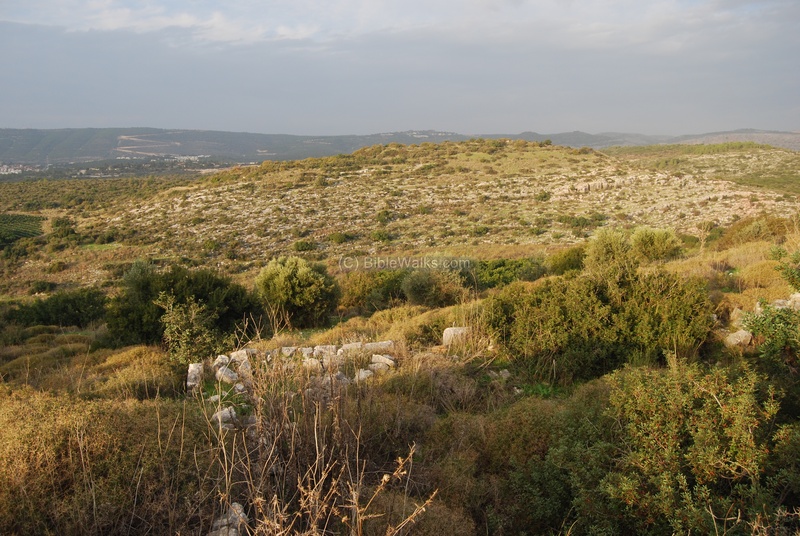 A panoramic view of the top of the Khirbet is seen below. Click on it to view in more details. The photo below shows a detail in the panoramic photo - with ruins of one of the houses. A view towards north, with traces of one of the hillside houses. A view of the top of the ancient site, towards east. An Ottoman period sheepfold is located on the eastern side of the site. The sheepfold is seen in a closer view. The road on the right background, behind the bushes, is the road to new Manot. A view of the structure towards north. Walls of a small house are located on the corner. A view towards north-east. Tell Avdon is on the left background, and new Avdon is on the right background. A Byzantine church is located on the south-east side of the site, but the modern road crosses it. Its apse faces the east, as seen below. 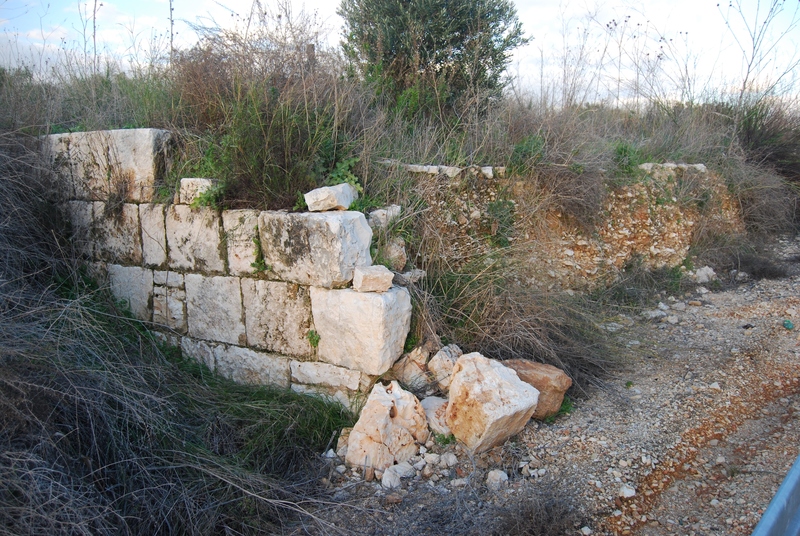 Another section of the church - the western wall - is seen below, exposed by the road. 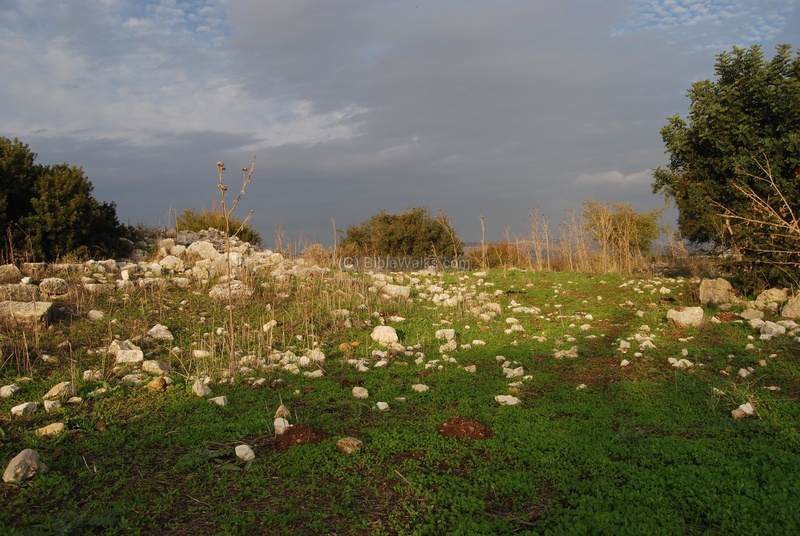 On the slopes north to the site is a large ashlars (gazit) quarry, where there are also several burial caves. One of the three caves in this cluster is seen below. 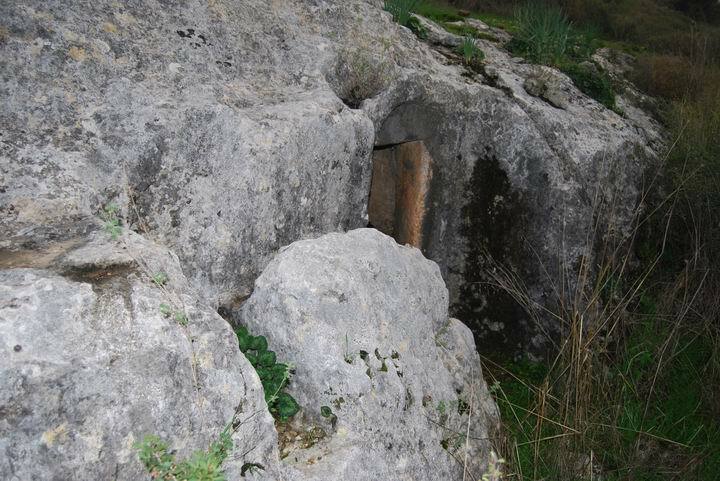 The grooves on the rock on the left used a rope to help open and close the heavy stone door (1M square, 0.27M thick) which was found near the cave. The entrance to the tomb is seen below. It has a square entrance with a arched recess around it, similar to the cave near Manot. 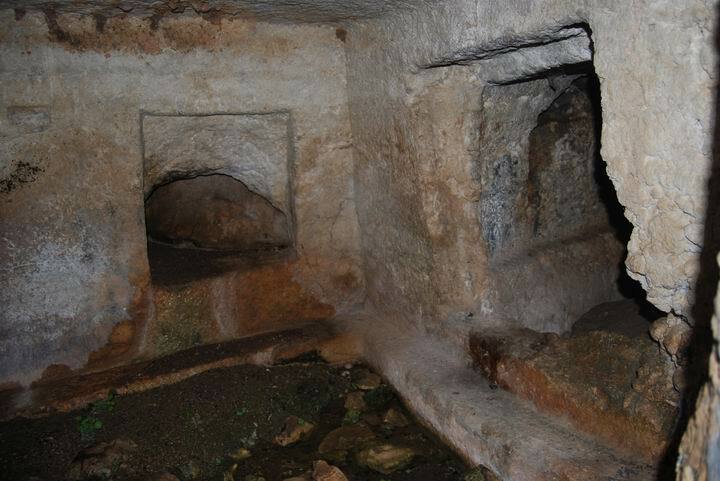 Inside the cave is a central chamber (1.8M square) which leads to 5 burial cells. The 6th cell, seen on the right side, is not finished. The west side of the tomb, seen below, has a pair of burial troughs. The east side has another pair. There are two other burial caves on both sides. The eastern cave has a cross engraved inside a geometric form. 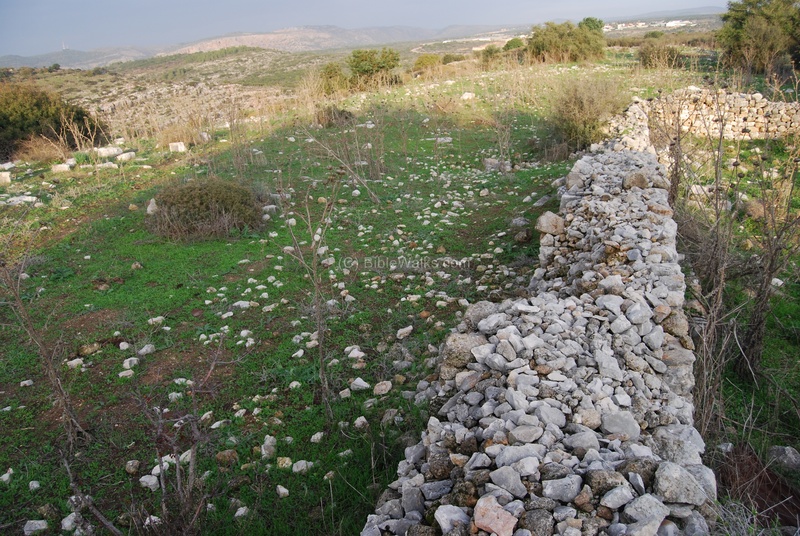 About 1.5KM east to Khirbet Suggar, on the north side of the road to Modern Manot, is a small stone pile. 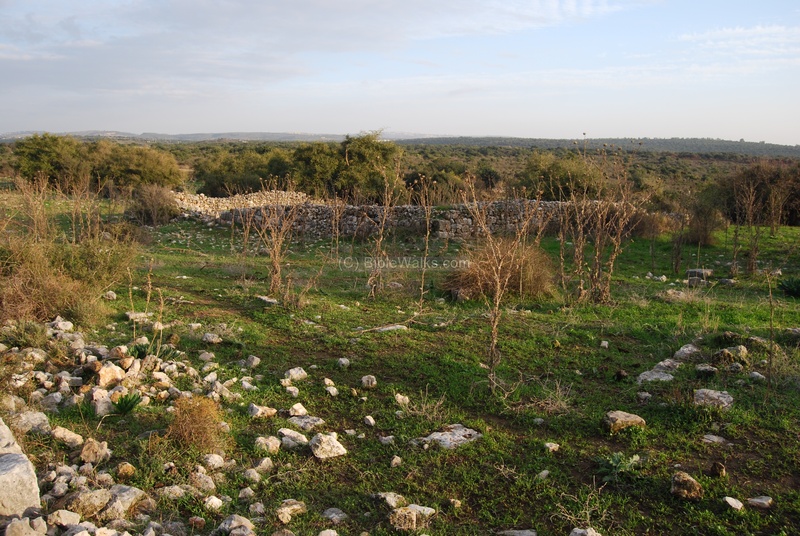 It is located on top of a small hill (spot height #187) which overlooks the Kziv valley. The round stone pile is about 3M in diameter, and made out of one level of large field stones. This may have been a tumulus (small mound), which was common in prehistoric periods as a tomb or monument. These tumuli are relatively rare in West Galilee, but common in the Golan and worldwide. The reason for their absence is probably due to the Biblical commands to dismantle all the Canaanite and Pagan altars. During December there is a variety of wild floors in the site, such as the cyclamen (Rakkefet). 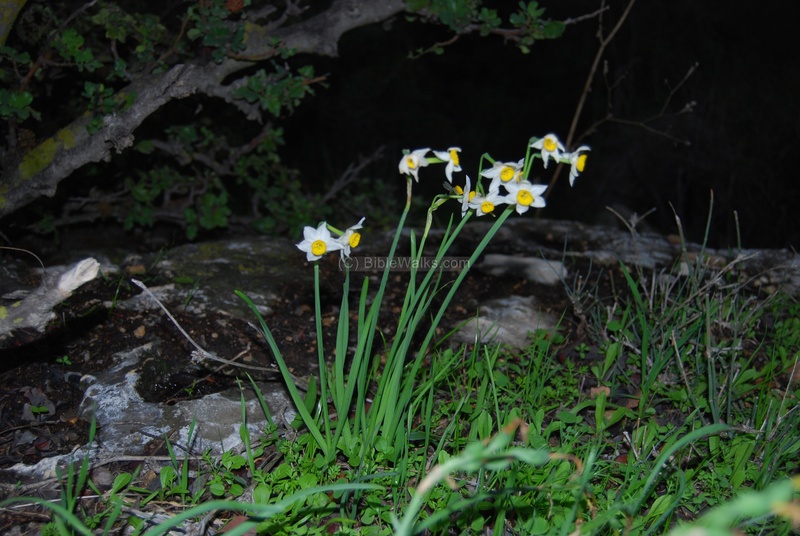 There are also wild daffodils (Narcissus). 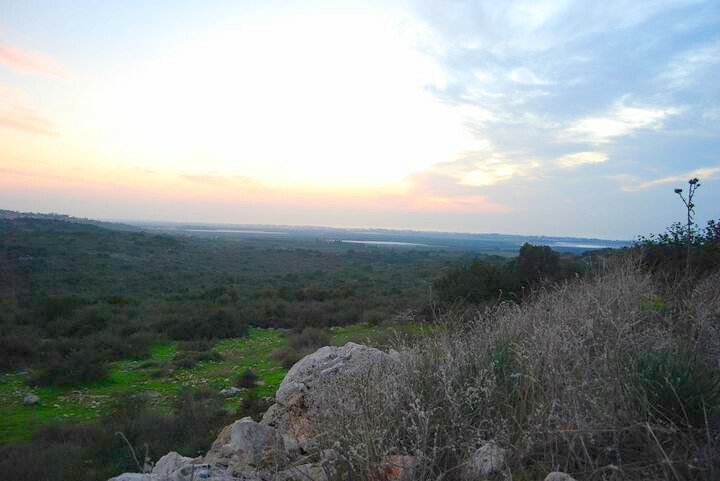 The photo below shows the sunset view from Khirbet Suggar, looking west towards the sea. 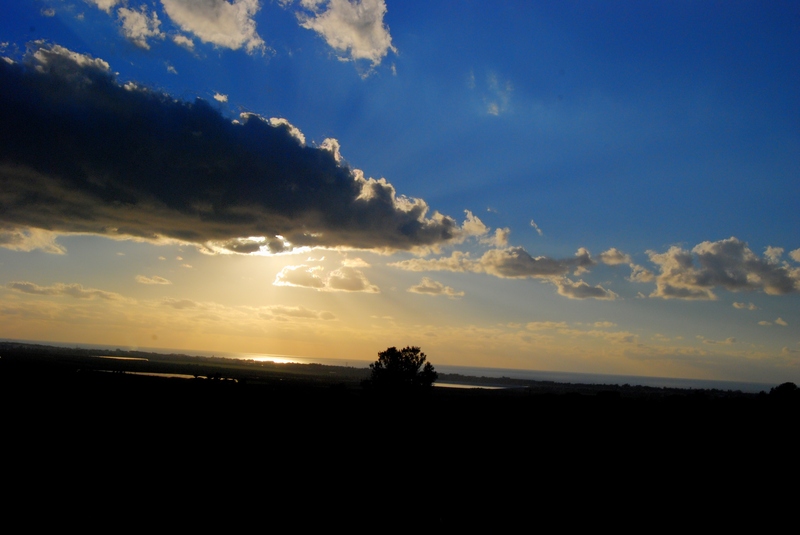 The city of Nahariya is in the far background. Another sunset view is seen in the photo below. Although this photo was enhanced, the sight is indeed spectacular almost every evening. Suggar - in Hebrew: cage. The root name is "sgr" which means "closed". Maybe the name is based on the large sheepfold in this site which is a type of a cage. Biblical reference: Isaiah 24, 10: "The city of confusion is broken down: every house is shut up, that no man may come in". Souadijereh, Souedjireh, Suweiyireh, Suweijira, Sajura - names of the site in various old maps and references. Boubarieh, Baubariehm Bobriyeh - other names of Khirbet Suggar, that some scholars relate to Manot. Khirbet (Arabic) , Khurvah /Horvah/ Horbah (Hebrew)- a ruined site. Biblical references: Leviticus 26,31: "And I will make your cities waste,...". Isaiah 44, 26: "...and I will raise up the decayed places thereof.